Behind bananas, I don't of anything Eva likes more than avocados. So when I saw data about avocados in the Data is Plural newsletter, I knew I had to pass it along to her. Using a line chart makes it easy to see the rising price. The title, while simple, tells us what the chart is about. There's no indication of the currency. The article mentions both US and Mexico as main sources, but the chart doesn't indicate whether it's dollars or pesos. The avocado in the background is distracting and completely unnecessary. If the avocado is removed, the line could be made black. Labeling the ends of the lines would add context. The title could be changed to something that tells the story in the data. Is this good or bad? Rising prices could be good if you're the produce, but bad for consumers. The gridlines could be more subtle. 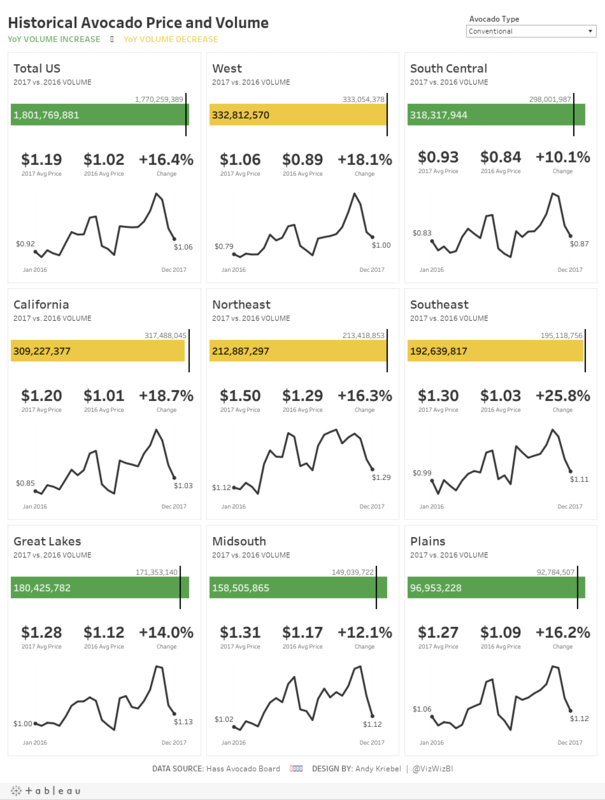 I wanted to create something that shows the trends for each city plus the overall. Include BANs for the current price and an indicator of the change. Create "cards" for each region, similar to the profit and loss statement I created.